Jakarta, December 18th 2014 – With Sumatra becoming an ever-popular destination for both business and leisure travel, Archipelago International made a favehotel debut on the flourishing island with the opening of favehotel Palembang on 15 December, 2014; the latest favehotel location that will cater to Pelembang's growing demand for budget business hotels. Palembang is the capital city of the South Sumatra province; the second largest city in Sumatra after Medan and the seventh largest city in Indonesia. The recent spike in commercial development in Palembang has brought a substantial increase in business travelers to the area, thereby triggering a high demand for cost-effective accommodation that directly services the MICE market. favehotel Palembang will therefore target South Sumatra's corporate business travelers whilst simultaneously being budget-sensitive and providing a cost-effective alternative. favehotel Palembang boasts a strategic location half way between the Sultan Mahmud Badarudin Airport and Palembang’s Central Business District. Its close proximity to the Palembang Trade Center Mall further makes favehotel Palembang an ideal base for business and leisure travelers alike. Archipelago International is dedicated to establishing favehotel Palembang as the preferred hotel in the area and a truly unique business hotel experience. Despite the budget price-tag, the 7-story hotel features a stunning open-air swimming pool and a high-tech gymnasium, together with delicious dining experiences that include the eclectic signature restaurant and the lounge bar that offers a robust culinary journey across the world. The hotel's 163 stylish rooms are modern, functional and super clean offering edgy interior designs decked out with LED TVs, security key card systems, air conditioning, in room safes and top of the line beds with high knot count cotton linens. The wide range of business facilities include the hotel's swimming pool for adults and kids, Gym, Wellness Spa, ample parking space, 6 modern meeting rooms and ballroom for training, workshops, product launches, exhibitions and other social events, as well as truly high-speed WiFi throughout the entire hotel, making this “fave” the best in class amongst the area's economy hotels. “We have been keen to introduce our favehotel brand to Sumatra for some time, so we are delighted to be opening favehotel Palembang this December at a time when affordable business hotels are in high demand. We hope that with our presence, Palembang’s MICE market will continue to grow, establishing Sumatra as the next best destination for Indonesia’s business travelers.” Said John Flood, Archipelago International's President & CEO. 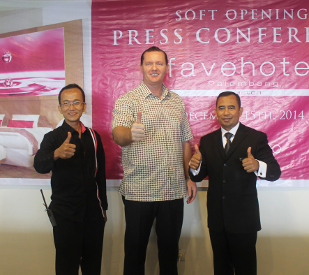 Soft Opening Ceremony of favehotel Palembang - Seen in the image from left to right : Mr. Aidhilluddin - Hotel Manager of favehotel Palembang, Mr. John Flood - President & CEO of Archipelago International and Mr. Muhaimin Ramza General - Manager of Aston Palembang. favehotels currently operates 32 hotels throughout Indonesia and Malaysia out of which 10 are in Jakarta and 5 in Bali and has a development pipeline of more than 40 hotels in Indonesia, Malaysia and the Philippines. Archipelago International is one of Indonesia’s leading hotel operators with an underlying portfolio of more than 90 hotels and 12,000 rooms. As a continually expanding brand, Archipelago International has a development pipeline exceeding 95 properties in Indonesia, the Philippines and Malaysia.